Corona Theatre was full to the brim with eager Montrealers awaiting Rhye’s show on June 8th. I sadly missed the opening act, HAERTS, an 80s-reminiscent synth pop band whose sound falls somewhere between Haim and Young Galaxy. The vocalist of HAERTS, Nina Fabi, has a singular, almost Stevie Nicks-esque quality to her voice, adding an edgy tone to their sound. Their self-titled 2014 LP is definitely worth a listen. 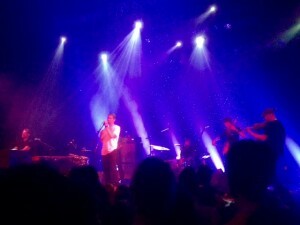 Rhye kicked off their set with their 2012 single “The Fall”, a crowd favorite for its sensual R&B-inspired smooth soul-pop. 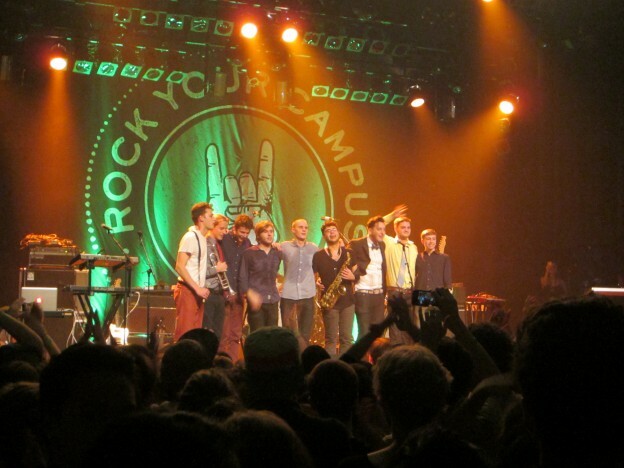 The band, which originally started as a collaboration between producers Robin Braun and Mike Milosh, performed as a six-piece act for their Montreal show. The keyboardist’s synth progressions had the passion of someone savoring their last moments on the Space Odyssey. The bassist was jiving to a funk beat and the lead guitarist dabbled with some post-rock solos. Even though the first couple songs were muddled by some minor technical difficulties, Rhye kept the audience happily enthralled with their stage presence. What really impressed me was how the band members were almost all multi-instrumentalist. Milosh sang and played some drums, the keyboardist played synths and vocals, the lead guitarist also rocked the trombone and viola, accompanying the violin player next to her. And despite all this musical juxtaposition, they transitioned well from one track to the next. Not many bands sound better in person, but they did! Towards the end of their set, Rhye asked the audience to try to be as quiet as possible to be able to play an acoustic song for them with no mics or amps. They were able to and succeeded in making Corona feel like an intimate venue of soulful music. Finally, their show came full circle with the much-anticipated single “Open,” and the crowd was left craving more of Milosh’s sultry voice. Rhye’s energy and obvious love for what they do just confirmed why I love to go see live music — and always will. This entry was posted in Reviews and tagged concert review, corona theatre, jess newfield, rhye on June 25, 2015 by CKUT Music Coordinator.